Leeds United's eagerly-awaited new away kit is due to be launched on Wednesday. 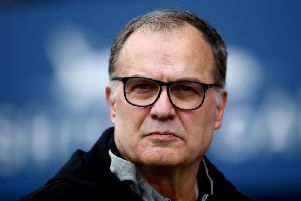 A statement from the Elland Road club, which also revealed the new Kappa home kit had "experienced higher than average sales", since its release last month, said the new away kit would be worn for the first time in the Championship match at Derby County on Saturday. The statement said: "Our new away kit for the 2018/19 season will be revealed tomorrow and will also be made available for pre-order, immediately after being unveiled. "The first team will wear the new 2018/19 away kit for the first time during the match against Derby County on Saturday afternoon." Whites fans have been speculating for weeks on social media as to how the new away kit would look and indeed, when it would be released. They now have their answer regarding the date, but the only other clue to emerge so far about how it might look, was a picture on Twitter of a Leeds United ladies development side in a Kappa blue kit - but some fans were quick to point out that elements of that kit had already been seen last season. Over the years, United have traditionally worn an all-yellow away kit, but also they have had other change kits in blue, black and green as well as on some occasions in the Revie era, red - the colours of old foes Manchester United. The statement added: "We have also encountered some issues with the speed in which garments are getting processed through customs once they arrive in the UK. "This delay, combined with sales exceeding expectations, has meant that our Leeds United store has now sold out of some popular sizes. "Home kit in all sizes will be back in store and available for purchase during the last week in August and supporters can pre-order the home kit from this Thursday. "We apologise to all supporters for any inconvenience this may have caused."